As Mid-Autumn festival approaches, it’s time to revel in this centuries-old festival with mooncakes. The festive celebration of reminds us of the legend of Chang E, the mythical Moon Goddess of Immortality. It is also the festive of savoring mooncakes while commemorating the reason mooncakes were created. Pullman KLCC is celebrating the tradition of this Mid-Autumn festival with an exquisite Mid-Autumn Collection’s Mooncakes with A Taste of Fresh Modernity at Tai Zi Heen. From classic Baked Mooncakes to modern Snow Skin Mooncakes filled with delectable fillings, this year’s collection is bound to be a scrumptious Mid-Autumn gift for every one of all ages. Perfect with Chinese tea, Tai Zi Heen’s mooncake collection is made by Chef Jeffrey Kwan and the culinary team. Each mooncake is carefully handcrafted to ensure a thin skin enveloping generous and luscious fillings in each bite. Classic is always a favorite and the Baked Single Egg Yolk with White Lotus Paste Mooncake is a perennial favorite, especially those who loves the classic pairing of lotus and salted egg yolk. The Baked Black Sesame & Mung Bean Paste Mooncake is wondrously aromatic of nutty and cream sesame seeds. Studded with lots of sunflower seeds and a center of creamy mung bean paste, this one’s a definite keeper. Known for some health values, the Baked Bamboo Charcoal Paste with Macadamia Nut Mooncake is great at sight as well as delicious in taste. The boost of rum in Baked Rum & Raisin with Assorted Nuts Mooncake elevated a classic to revelation of flavours. Jam-packed with lots of nuts and other goodies, this one takes mooncakes to new heights! For snow skin series, this year’s mooncake collections offers two sizes of mooncake delicacies. Indulge in the Snow Skin Dragon Fruit & Mung Bean Paste Mooncake, a delicate and fruity touch of sweet dragon fruit paired with creamy and nutty mung bean. There is also the local but all-time favorite Snow Skin Pandan Lotus & Mung Bean Paste. The lush aroma of pandanus leaves enhances the lotus flavours well along with the mung bean paste, rendering a familiar and soothing note on the palate. Saving the best for last, the Snow Skin Mini Dark Chocolate & Single Malt Whisky Mooncake is utterly divine and wicked in flavours. Rich with dark chocolatey notes jazzed up by the addition of whisky, this one rocks in flavour and lusciousness. Besides savoring these lush mooncakes, one can also get a hands-on experience in making your own snow skin mooncakes from Tai Zi Heen’s Chef Kwan. Sign up for Tai Zi Heen’s Mooncake Master Class on Aug 19 where one can learn to make four flavours of snow skin mooncakes, paired with Harney & Sons premium tea, followed by Yum Cha (Eat-All-You-Can Dim Sum Brunch) for RM150 per adult. 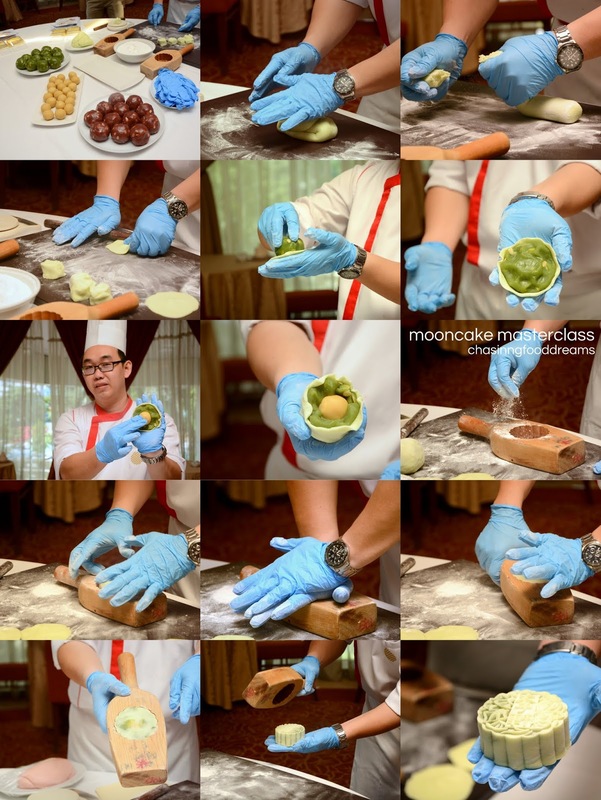 We also had our very own Mooncake Masterclass by Chef Kwan and the session was indeed fun and interesting! For more information on Mooncake Masterclass by Chef Kwan, check out their Facebook link here. The Tai Zi Heen Mooncakes are priced from RM25 per piece while box sets prices range from RM108 for a box of 3 mini pieces to RM128 for a box of 4 standard pieces. The mooncakes are available at Tai Zi Heen Chinese Restaurant and also the Hotel Lobby from 11.00am to 8.00pm daily from 1 August to 4 October 2017. All prices are inclusive of 6% GST.